Which $234,000 AIDS Executive is on 3-Month Paid Leave? Doesn't your queer heart just break for our well-compensated executive directors of LGBT and AIDS nonprofits, knowing that in addition to robust six-figure salaries and lots of benefits they also get months off from work and still get paid? Earlier this month, I blogged about Kevin Cathcart at Lambda Legal, whose salary is $318,650, going on a two-month sabbatical. He's not the only queer nonprofit on paid-leave this summer. Asked how they would select members of New York City advisory bodies, such as the one that decides how the city should spend the roughly $100 million in AIDS funds it receives annually from the federal government, all the candidates said they would consult with community groups. 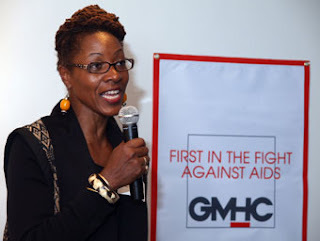 When Bill Thompson, the former city comptroller, suggested he would put [GMHC CEO Marjorie] Hill on the AIDS advisory board that drew a chorus of loud boos. Hill, who has headed the AIDS agency since 2006, started a paid leave on July 1 and will return on October 1. Two senior GMHC staffers said that reports that Hill would leave GMHC after the three months of paid leave were incorrect. According to GMHC's 2012 IRS 990 filing, Hill was compensated $234,000 for her services, and thanks to Gay City News we know about the nonprofit liberal paid leave policy for the top person. Nice work and perks, if you can get 'em! Please let me know if you notice any difference in advocacy or impact upon queers and people living with AIDS at either Lambda Legal or GMHC with the top executives taking the summer off.